Boom hoist ropes are an essential component on each crane. 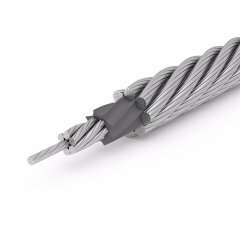 For this specific use, TEUFELBERGER develops and produces high performance 8-strand steel wire ropes that excel, especially in terms of reliability, safety, and lifetime. These characteristics are indispensable for the cost-effective operation of ship cranes. Apart from meeting all technical requirements, reducing total costs of ownership is a paramount goal for crane operators and, as a consequence, also for us as a manufacturer of crane ropes. Crane manufacturers relied on highly compacted 8-strand TEUFELBERGER boom hoist ropes for their deck cranes. These ropes feature PLASTFILL®, a technology developed by TEUFELBERGER that encases the steel insert in a synthetic coat. This manufacturing method provides high safety and reliably protects the rope core against corrosion – throughout the rope's entire life span. The special construction of these 8-strand ropes in combination with the SUPERFILL® compaction technology with diameters of up to 76 mm makes them highly resistant to being crushed in multilayer spooling operations. This has an extremely positive impact on the profitability of heavy lift cranes. On special request also high performance 6 strand ropes can be offered. We provide standard and crane-specific rope end terminations as well as the necessary certificates for each crane rope. All TEUFELBERGER ropes undergo thorough and comprehensive quality testing procedures. Excellent resistance to negative external influences and superior versatility for applications are what sets this rope apart.